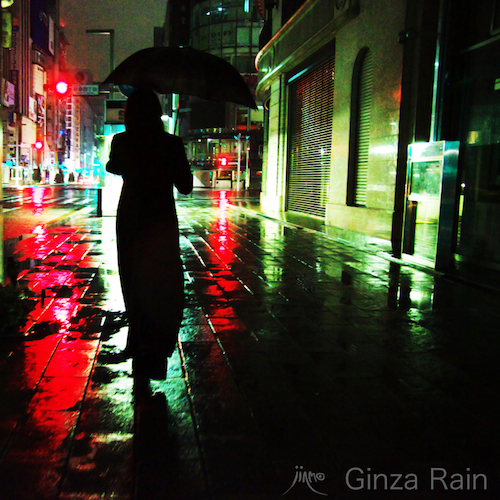 JINMO's 115th solo album, it's crowning the title "Ginza Rain". "I like the sound of rain, especially the sound of rain before dawn. The rhythm is plectics pulse. Interval of every drop, it is simple to infinity at microcosmic view, is the time of extremely complex systems at macrocosmic view. This work is plectics pulse of the sound of rain. Ginza Rain, it functions as the device of magic rituals such as the concatenation of genesis and future, it wets my body, but it also wets my spirit." Every rainy day, JINMO always posts about the beauty of the sound of falling rain on the Twitter. We would understand †that he feels the beauty not only with the tone but also with the rhythms as plectics pulse by this album and his words on the above. This album "Ginza Rain" is the orchestration album made of only computer generated sound. Similar to "Miryam", "Fetishia" and "tar", the complex and dense multi-layered rhythms are quite differs from rhythms originated in common Western music. It sounds urban and futuristic, it also sounds like the sound of rain pouring into the primitive sea before the †rise of mankind in the ancient time. Enjoy the raindrops of plectics pulse, enjoy the mysterious beauty of rain, feel the drops of falling rain with your body and your spirit!